Accomplished chef Sang Yoon serves Spanish-inspired tapas and one of the best burgers in L.A.
: Chef Sang Yoon used to cook gourmet California cuisine at nearby Michael's, but when the itch for his own place hit, he took over this tiny, unpretentious local bar and grill and added his own touches. 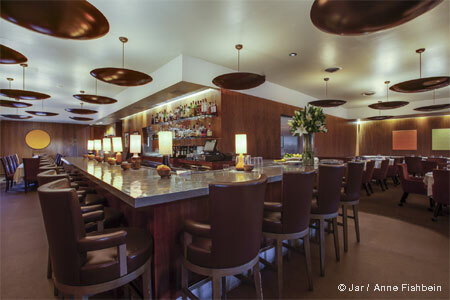 Though he prepares flavorful Spanish tapas, the main attraction here is the Office Burger, which is among L.A.'s best. A patty of dry-aged beef is topped with caramelized onions, Gruyère and Maytag blue cheeses, apple wood-smoked bacon compote and arugula, all served on a soft roll. A basket of fries arrives in a miniature grocery cart with garlicky aïoli. Yoon allows no substitutions or alterations of any type, so guests will have no luck asking for ketchup. 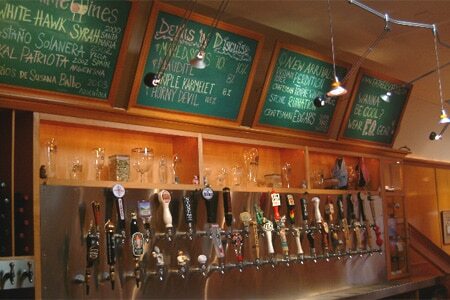 The bar features a great selection of beers, in addition to a decent wine list. Just know that there are no reservations and no waiting list, so be prepared to battle for a table with a crowd that's been drinking. Other Father's Office location in Los Angeles.